By Matthew Braga on June 23, 2011 at 1:30 p.m. Nothing — not even the original packaging — can stop your old consoles or computers from aging. Try as we might, even the most well-protected hardware can't stay new forever. Coca-Cola spills and accidental drops are ever-present possibilities, of course, but there's little you can do to stop the inevitable march of time. However, some hardware ages better than others. 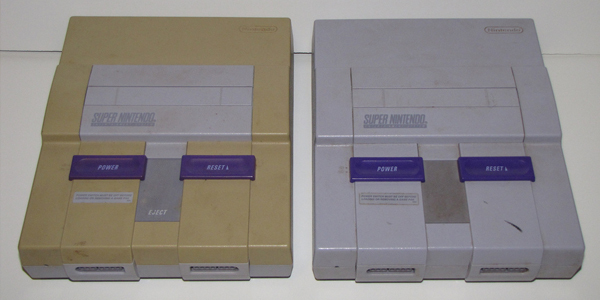 It's the reason why your friend's Super Nintendo looks fresh and unscathed, while your own console sits forlornly in a corner, tinted yellow to the core. "Cigarette smoke!" some will holler, convinced that's the reason, but the actual explanation might surprise you. 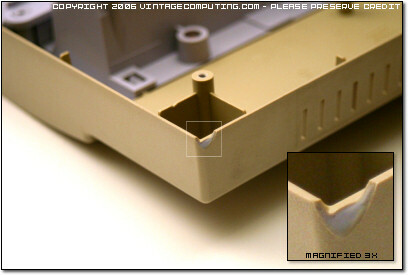 There are many different types of plastic, but the kind most commonly found in old computer hardware is called ABS, or acrylonitrile butadiene styrene. In its pure form, ABS plastic is combustible, however, and not the sort of thing you want in a mass-market consumer product. Thus, plastic manufacturers mix in a variety of flame retardant chemicals — usually involving large amounts of bromine, a naturally brown liquid — to help reduce a product's chance of catching fire. The problem is that bromine undergoes a reaction when exposed to ultraviolet (UV) radiation — in other words, most sources of light, both natural and artificial. This breaks the bonds that were created during the manufacturing process, and leaves bromine molecules free to seek out oxygen. This process, also known as oxidation, is responsible for the increasingly brown or yellow appearance of old plastics over time. Nothing — not even the original packaging — can stop it, and added heat and UV light can actually accelerate the rate of discoloration. If you were to chip away a small portion of an affected case, you could see this process in action. The inside layer of plastic often retains its original color because it has been exposed to little or no oxidation. Perhaps in one of the production runs of plastic, they didn't get the catalyst or flame retardant mixture quite right and more residues were left over in the top half's plastic batch, thus causing it to degrade more rapidly over time. 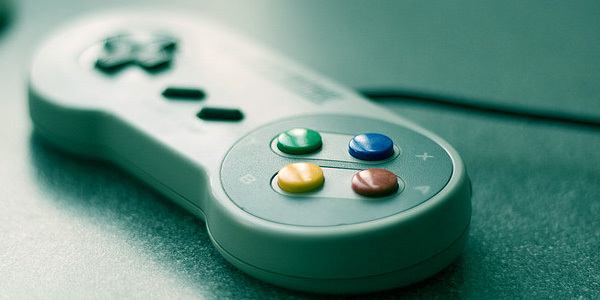 And by the time Nintendo produced the later runs of Super Nintendos, they had probably fixed the problems in the manufacturing process of their plastic, meaning that those later models aren't as susceptible to oxidation as the earlier models are. Simply put, Nintendo could have used a more stable plastic that would have been less susceptible to discoloration, but chose ABS plastic for its manufacturing simplicity and reduced cost. As you've probably gathered by now, not much. There's simply no way to reverse the chemical reaction that's taking place. However, there are ways to compensate, and in some cases, restore a plastic to its original color — at least temporarily. Perhaps the most obvious solution is to use some sort of abrasive material to get past the discoloration. Light products, such as a Magic Eraser, are good for surface dirt, but can only remove so much. A more radical approach would be to use some light-grain sandpaper. But be wary: in both cases, you're literally removing layers of plastic with each rub — layers you can never get back. 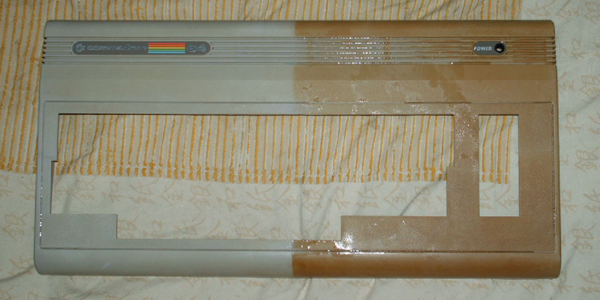 From the Retr0bright Wiki, the shell of a Commodore 64, after being partially immersed in liquid for eight hours. A more recent and potentially successful approach is to use a high-concentration solution of hydrogen peroxide, mixed with other household chemicals. This is actually quite dangerous — there's a risk of burns and blindness here folks — and should only be completed with the utmost care. However, if you're interested, check out the Retr0bright wiki, which offers a number of tried and tested cleaning recipes that, in some cases, can restore old yellowed cases to an almost-new looking condition. There are potential side-effects, of course, such as fading logos and labels, but the restoration benefits might be worth it for some. Of course, it doesn't hurt to ensure that cigarette smoke isn't the real source of your yellowing woes first, especially if your computer or console was bought second hand. Nicotine won't penetrate any deeper than the surface of the console, and can be removed relatively easily with a light abrasive material or cleaner. One of these things doesn't belong. 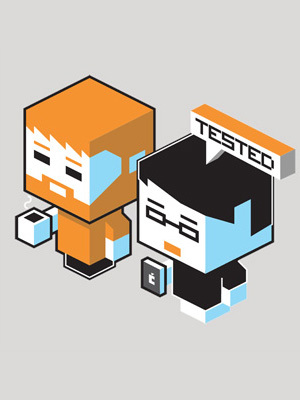 Image via Flickr user Redbeard Math Pirate. In conclusion, the next time you feel the urge to fret about your old, yellowing electronics, worry not — the blame for this particular problem rests squarely on the shoulders of someone *other* than you. Lead image via Flickr user mikezs.